Order issue 110 online today, or download a digital edition to your smart device in just a couple of clicks. 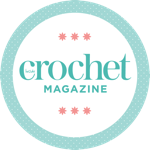 When I first learned to crochet almost ten years ago, one of the first things I discovered was that a whole world of colour had opened up to me. The day after learning how to hook up a granny square my friend took me to a yarn shop and I couldn’t wait to get my hands on all the different shades – it was overwhelming! I instead chose a palette of soft blues and cream, unable to pick from the bright shades, but my appetite for colour soon grew and once I discovered a certain blog written from an attic in Yorkshire I was hooked (pardon the pun) on colour!